Man is a creature of vanity; of arrogance; of man’s own elevated sense of what man is and can accomplish. The end times are a time of GREAT deception: practically ALL of mankind is deceived. Because he is arrogant and vain, man’s end-of-the-world stories usually revolve around himself as the cause of his ultimate destruction. The various stories of Satan all contain a few of the same elements. One element which is constant is that deceived man MUCH PREFERS the “end of the world” stories of Satan to the Biblical account. In fact, man LOVES Satan’s stories–mostly because they do not require man to change his spiritual behavior. Oh sure, Satan’s stories usually require man to give up something: his freedom, his wealth, what little control of his life he may have. But then, that is one mark of the stories of Satan: the public must sacrifice something (many times, its wealth) to the minions of Satan (who are running the show). A few question the reader will not find answered by Satan’s Mouthpiece (the Corporate Media): WHY is it that those in charge when the “end of the world” problem was created are not given the boot? WHY are the same culprits (government, military, business, science) who were previously in charge when the problem supposedly started, the same ones who are in charge of correcting that problem? A few more observations about Satan’s “end of the world” stories, what God’s Word declares will actually happen and man’s historical rejection of the Bible in favor of satanic stories. 1- The stories of Satan naturally contradict God’s Word. This questioning of what God has told man has taken place since the beginning. 3- God’s Word does declare that there will be some very distinct and noticeable CHANGES once Jesus Christ returns to earth. On the one hand, God will re-make this earth so that only righteousness is present. The old heaven and old earth will pass away and no longer be remembered. 4- Satan’s stories puts MAN in control of his ultimate future–instead of his Creator. That man controls his future instead of his Creator is a story Satan has been whispering to man since the very beginning. 5- One mark of a satanic “end of the world” story is that it frequently is replaced by a new story when the public show signs of disbelief in the older one. Another mark of the satanic story is the overwhelming number of media pieces on a daily basis predicting destruction, doom, terror, death and chaos because of the object of the story (nuclear war, global cooling, depletion of the ozone layer, etc.). Still another mark of the satanic story is the cry of the ruling elite and the rest of the rich and celebrated that “We have to do something RIGHT NOW to stop this!” It usually turns out that “something” is MORE government control of people, places and things AND/OR more money being shoveled into the hands of government. 6- One earlier story which was popular in the 1970s was the one about man depleting the ozone layer and the resulting destruction of the environment/earth. 7- Another earlier “end of the world” story concerned “acid rain.” Supposedly, the lakes and forests were being destroyed by acidic rain produced by coal-burning power plants. 8- There have been numerous satanic stories about the “end of the world” which challenge the Bible’s account. One of the most popular in the 1970s was the one about “global cooling.” This story was popular because the winters of the 1970s and mid 1980s were frequently very cold. 9- One of the most popular of Satan’s “end of the world” stories is the one about man destroying the earth using nuclear weapons. This was a very popular story after World War II. 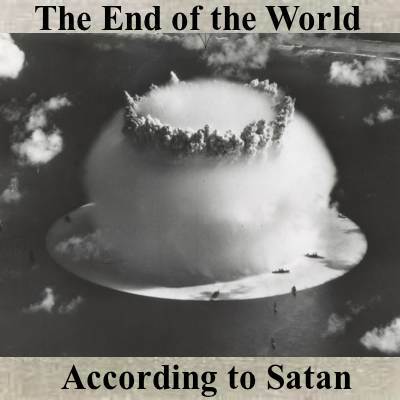 Currently, Satan’s most popular “end of the world” story is most probably the one about climate change. Again, both of these stories put man in control of his future. But, once upon a time in the 1980s, there was a story which COMBINED nuclear war, the new Ice Age AND climate change. 10- As with all of Satan’s stories, when one story begins to lose steam, another is concocted. “Nuclear winter,” or as it was initially termed, “nuclear twilight,” began to be considered as a scientific concept in the 1980s, after it became clear that an earlier hypothesis, that fireball generated NOx emissions would devastate the ozone layer, was losing credibility. DOES the reader wish to know what really happens? DOES the reader worry about one of the satanic “end of the world” stories happening? HAS the reader ever stopped to consider why it is that when one satanic “end of the world” story fades away, another one almost immediately takes its place?